925+ people who signed the petition so far. The Planning Commission has voted to defer their vote on whether to accept or reject this FEA, so it’s still possible they may accept it in the future. We’ll keep you posted as new developments occur! The Planning Commission will likely be re-hearing this issue within the next 3-6 months. If you haven’t already signed the petition to the Planning Commission asking for a more thorough Environmental Impact Statement study to be done, click here to add your name. On Tuesday, January 10th, the Maui Planning Commission will decide whether to approve the Makena Development Resort’s Final Environmental Assessment (FEA), which claims the 47 acre development will have NO significant impact on the area, despite the fact that the site is full of environmental and cultural treasures. In addition, the 47 acre development is very clearly just one small part of a much larger 1,800 development project that is being planned for Makena by the land owners. We want the Planning Commission to REJECT this Final Environmental Assessment for the 47 acre project and instead require a much more thorough Environmental Impact Statement (EIS) be done for the entire 1,800 acres. An EIS will examine 1) exactly how this project will negatively impact the surrounding environment, and 2) how to mitigate these impacts before any final development plans are put in place and construction starts. 1) Click here to sign the petition to the Planning Commission. 3) Testify in person at the Planning Commission meeting – Tuesday the 10th at 9 am in the Planning Department Conference Room, First Floor – 250 South High Street, Wailuku. 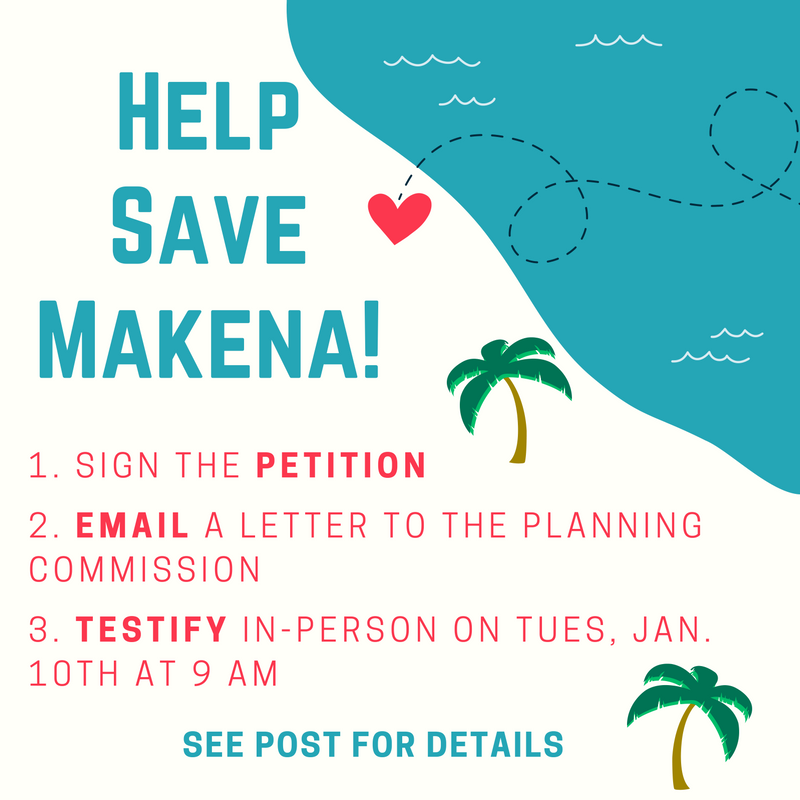 They need to hear the voices of Makena residents and how building at Makena Landing will negatively affect families, cultural rights and access, and our environment. Please be RESPECTFUL of the Planning Commissioners. They are volunteers who are giving their time for the community. 2017 budget needs to have more funds put towards the purchase. The Mayor needs to know the people care! 3) County should start with the 4 lots (267 ac) already proposed, and open discussion w/ A&B on the other two lots. 4) the 267 acres are important place for our Kupuna and should be protected to give them a place to pass on traditional knowledge of many cultures. 5) there are many groups who want to put the lands to good use and help serve community needs (farming; trails; cultural education; camping area for youth programs, green cemetery, surf contest access and community use. WHAT HAPPENS: Each budget hearing allows citizens to tell go up to a table where the mayor and his department heads are sitting and support items that should be in the next County budget. A group can go up together with one spokesperson, or you can go up as one person. Be sure to go to the table where the Mayor and Managing director are. One of the lots has already been sold. 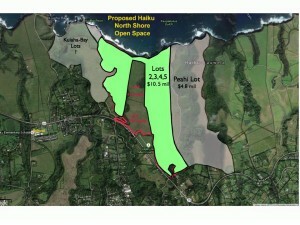 Don’t let this turn into another Palauea where we lose our chance to preserve shoreline for the public. Is the ocean water near you brown from runoff and sedimentation? It’s really simple… grab a sample of water, collect some information, and bring it to the Killa Wiffa Surf Shop in Honokowai (West Maui) or the Hawaiian Islands Humpback Whale National Marine Sanctuary (South Maui, 726 South Kihei Rd), where trained water quality monitoring volunteers can read the sample using the turbidity meters housed there and upload the data to the Coral Reef Monitoring Data Portal (http://monitoring.coral.org). Keep samples on ice or refrigerate (?4degrees C). 9. Keep chain of custody and other kit materials with sample, if you give it to someone else to deliver, fill out the sample transfer form. The Turbidity Task Force is a community-based monitoring program sponsored by The Save Honolua Coalition, Maui Nui Marine Resource Council and partners including Aquanimity Now, Coral Reef Alliance, Digital Bus, Hawaiian Island Humpback Whale National Marine Sanctuary in cooperation with local community groups. Take photos of upstream and downstream. If there is a tributary flow (contributing stream from natural streams or roads, driveways, sites etc,) take pictures of the stream upstream of it entering and downstream. Take actual measurements of water lines, debris lines, mudlines, when it is safe to; before the forensic evidence disappears. A picture of a mud or water line with a ruler or tape in the picture is best. Pictures with recorded measurements also good. 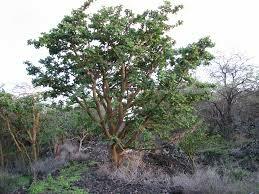 RE: Updated information on locations of ‘awikiwiki (Canavalia pubescens) to consider as part of listing 38 Species on Molokai, Lanai, and Maui as Endangered, Final Rule; and designation of Critical Habitat. 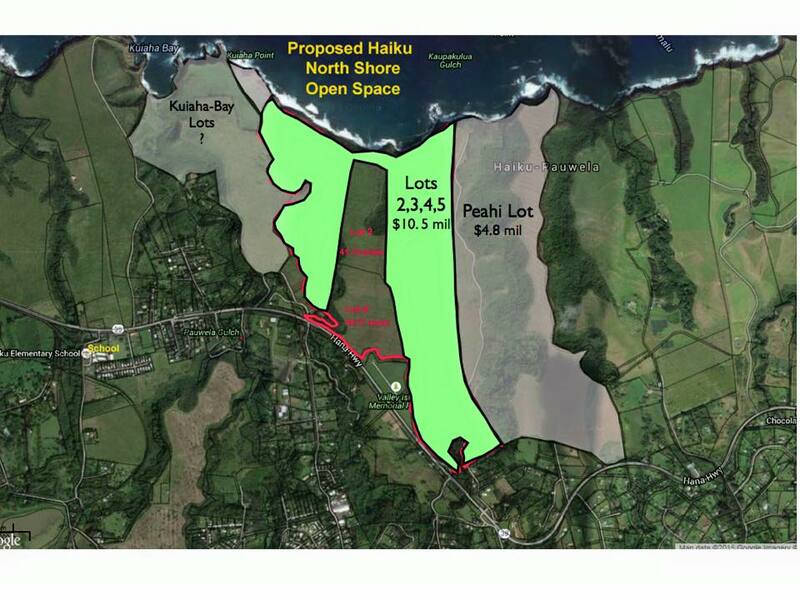 When the Wailea 670 (Honua’ula) development was granted a zoning change from agricultural 30 conditions were imposed as Maui County law. Sierra Club observes that not all these conditions are being met and has filed a lawsuit challenging the Wailea 670 EIS.